This history was compiled and edited by Linda Griffith Smith using programs from Worthington’s 100th, 125th, and 145th anniversaries. Pictured above is the Worthington Church, photographed in 2016. The original church is the taller center section. The wing on the left and the vestibule on the right were added to the original church as described in the following church history. Traditionally, in the early years of Madison County settlement, like-minded neighbors would begin to regularly gather for worship services at each other's homes. They were sometimes served by itinerant preachers or one of the neighbors would serve as a lay preacher. In southern Madison Township, a group of five families met in various homes for worship for several years and then they organized as a Methodist class in the year 1868. Charter members were the George Brown, John Kingman, Leroy Anderson, George Nichols and Ludwick Fritz families. The doctrine adopted was that of the Methodist Episcopal Church. Others who soon joined them were the John B. Oldham, Andrew Oldham, John LaPella, Dan Eyerly, Bunell Woolsley, George T. Clements, and John Whitenack families. Six years after organizing, grounds for a church building and cemetery were deeded to the trustees in 1874 by the Woolsley family. The church was built in 1880 and 1881 and heated with two large coal heating stoves. Stone for the foundation was hauled from Middle River, a long day’s journey by team and wagon. In 1913 a coal furnace was purchased, which required a small basement under the church to house it. A small vestibule was added in 1915. In those horse and buggy days, the minister frequently drove out from Earlham during the week and visited among the people, staying the night at one of their homes. Kerosene lamps hung from the ceiling for many years. In 1914, carbine lights were installed and used until electricity was available in 1947. The first organ was placed around 1892 for worship services and it was replaced with a piano in 1916. Over the years, a digital piano, grand piano, and Wurlitzer organ had been donated. The parsonage across the road to the east housed ministers from 1918 to 1993. In 1953 the Sunday School attendance had outgrown the one-room building so a full basement was dug under the church. The vestibule was removed and replaced with a larger vestibule and classroom, and stairs to the basement were added at the entrance. Kitchen and dining equipment were then moved from the parsonage basement. At this time, a gas furnace was purchased. In 1955, running water was installed in both the parsonage and the church, making possible the installation of modern rest rooms in the church basement. The kitchen was moved back to the basement and has since served many ice cream socials and harvest dinners. Five years later, more room was needed for Sunday School classes. 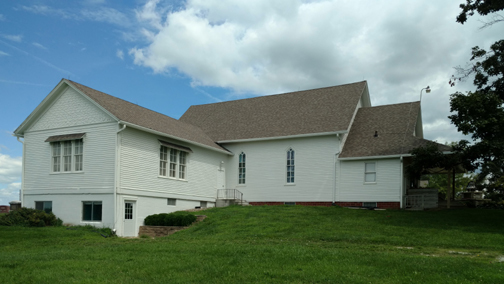 In 1958, a vacated one-room school house was attached to the west side of the church, with a full basement beneath, partitioned for a hall and three classrooms. The first floor of the one-room addition is used as a chapel and a second furnace was added. At times, Worthington Methodist Church had close associations with other Methodist churches at Earlham, West Star, De Soto, Penn Center, Early Chapel, and Webster. The church bell in the stone bell tower on the front lawn has been part of several of these churches. It was part of the De Soto church from 1880 to 1948 when it was moved to the West Star Church. Then in 1969, as West Star closed, Worthington received the bell as a gift. The old fashioned narrow seated pews were replaced with more comfortable ones given by Webster when it closed in 1972. Church members have been active in Sunday school, mission support, women’s societies, youth fellowships, and group social activities. The families have maintained a strong connection to each other and the Worthington community across multiple generations. The first “Homecoming” was held in 1922 and continued annually through 1970 except for a disruption in 1926 due to a terrific rainstorm. From that time, occasional homecomings have been held, notably in 1993 and 2013. This page was created on August 08, 2016. This page was last updated Tuesday, 09-Aug-2016 01:18:11 EDT .